A couple weekends ago I took the dog for a walk through the Water’s Edge property to get a better feeling for the landscape. 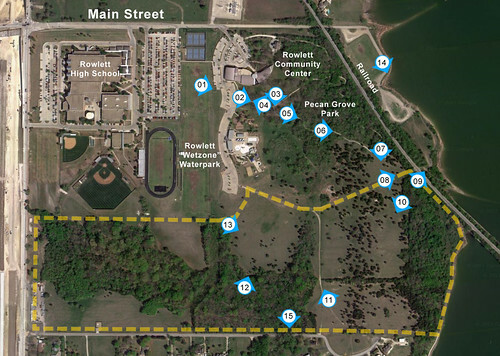 As I’ve noted previously, the site is already home to the Rowlett Community Center and the Wet Zone water park, both of which are set against the magnificent backdrop of Pecan Grove Park. 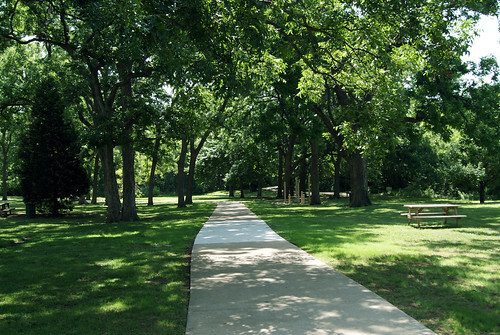 The park is an amazing local amenity full of legacy pecan trees and with a great little paved walking trail. The community center’s main gathering rooms have great walls of glass which look out upon this in dramatic fashion (as you can see in these images from the design charette here). 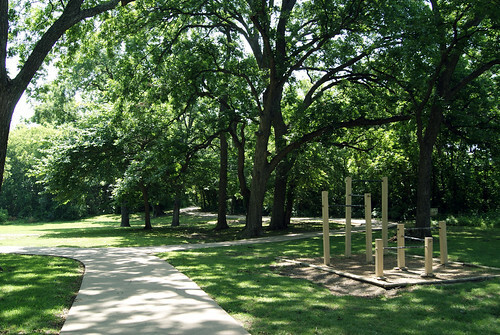 Nestled within are also benches, picnic tables and playgrounds that are often used on the weekends. Currently the primary way into the park it via the end of Main Street, then down through the parking lots between the Community Center and the Wet Zone. Its a bit confusing getting in here, what with the Wet Zone and everything being accessed through the Community Center’s parking lot. This shot is from the parking lot looking straight down into the main copse of trees in Pecan Grove Park. 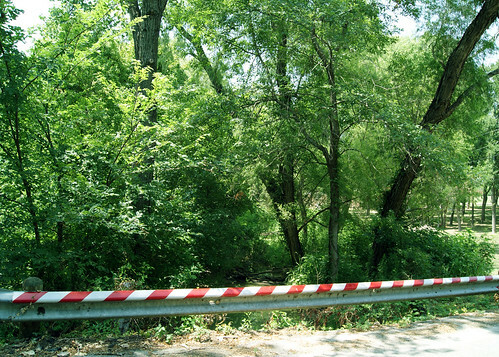 This image notes the entry point to the park between the Community Center and the Wet Zone. Rowlett used to hold their 4th of July Freedom festival here, but they’ve since moved it downtown. I always thought that in the middle of the July heat, it was always nice to have booths and bounce houses in the shade of grove of trees. I believe it’s a 1/2 mile trail that winds through the trees, and this is the head where the loop splits to eventually return back on itself. This is the view back through the trees with the Community Center beyond to the right. You can see the amount of grade drop through here, with the second floor of the Community Center here, which is even with the first floor of the center at the entry on the other side. As you can see, the Rowlett Parks Dept. have done an excellent job with this “trail”, which one might successfully ague it is far better than. 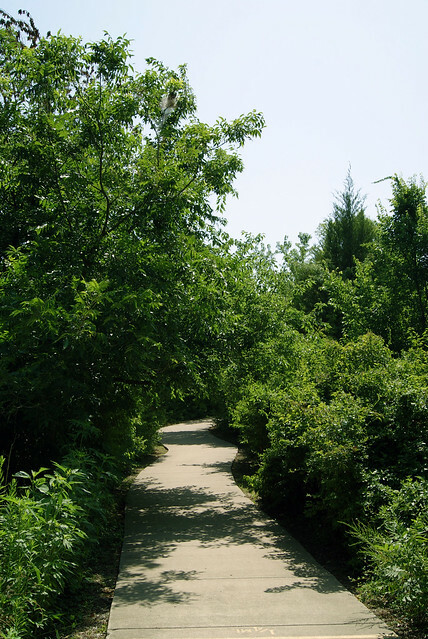 At the northern end of the trail the trees are the largest and the undergrowth the densest. Further down the trail the vegetation opens up and offers a wider trail with views out into fields that are well tended and completely open to the public. When the trail curves back to return North and head to the Community Center, I leave it and press into the open. This is where the bulk of the site opens up into large fields dotted with various trees and framed by hedgerows. The height of this area offers glimpses through the trees to some impressive views of the lake. Following that path down a ways, one stumbles on the railroad tracks. I was actually surprised how far above the tracks the terrain is in this location. 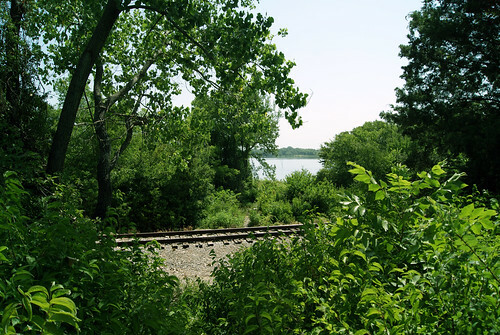 Currently, the tracks are the boundary between the Water’s Edge property and a slender strip of waterfront owned by the City of Dallas. Wandering through the property southward, the land unfolds in a series of open areas, again framed by hedgerows, and populated with scrub trees. The southern edge of the site is bordered by several large, nice, older single family homes. Turning north from them, one again proceeds through a series of hedgerows and fields. The area between images 10 and 11 is the high point of the site, and you can see in this image how the topography starts to significantly drop then to the West. Beyond the hedgerow, the open fields circle around and slope down with the topography. To my back is some of the densest vegetation I’ve seen in this area, and it being the height of poison ivy season, and me lacking a machete, I decided not to forage my way inside. Suffice it so say that in the low parts of the site, there are heavily wooded tracts of some spectacular tree size. This image, however, looks back up the hill toward the Wet Zone along the same gentle fields. Up from the lowlands of the site, looking back the way I came, you can see the incredible vista across the dense forest below (and maybe even spot my dog Patch lying in the shade of a lone tree – he loves a hike as much as any dog, but he’s not stupid). A bit of a divergence, this shot is taken looking South from the Dallas owned land fronting the lake on the other side of the railroad as image 09. It’s a shame that the city hasn’t found a way to try and incorporate this property into the development. Even with the railroad bisecting the site, a surface crossing could be offer a cost effective solution to linking the two, and would be far more politically viable than moving the rail. In any event, it’s a beautiful site that is currently host to little more than a soccer field and some decent fishing spots. Nestled about 2/3 the way down Miller Heights Drive, this creek connects up to the low areas of the Water’s Edge and appears to be the primary water drainage corridor for the entire site West of the hill beside the lake. This site is seriously one of the most magnificent ones I have seen in my 13 years as a professional. 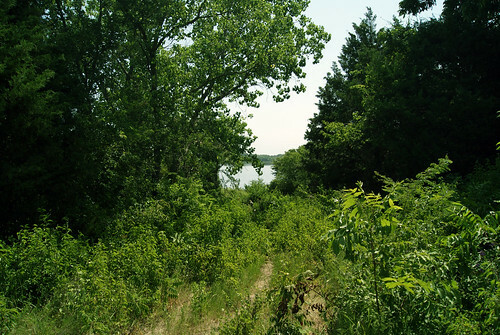 Aside from just the logistical location, almost exactly at the corner of PGBT and Hwy 66, the accessibility to the water, the natural topography, the vegetation, all of it lends itself to some incredible possibilities that can rarely be exploited in this region. A quick analysis of the property reveals that there are dramatic differences in land types through the site. The obvious locations for development are the broad flat expanses between hedgerows, designated above with a . Each provide prominent views either to the lake or across the tree tops of the lower lying areas. Well distributed, and consisting of almost 50% of the site, these locations afford a good deal of easily developable land area. Some might argue that the greatest virtue of this site is the access to the water, but I don’t agree. Steep slopes fall away from the high flat areas to create some magnificent low lying, heavily wooded tracts. 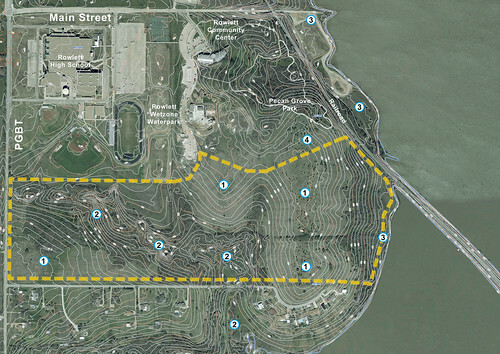 The orientation within the topography notes very clearly where the site’s storm water runoff drains (into low areas and out the creek noted in image 15, and then into the lake). 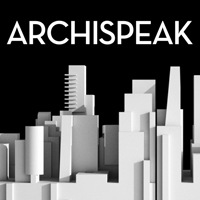 Any development is going to have to consider this carefully, because with the addition of impervious surface as a part of development (asphalt, rooftops, etc. anything that is non-green) will then add to this drainage and, if not properly handled, can lead to erosion along the creek bed or possibly even flooding of the nearby homes. In this there is a dramatic opportunity. Very few sites have this sort of amenity to be exploited, creating views for high-end apartments & restaurant terraces, nature trails & public gathering spots, all within a gorgeous swath of existing legacy trees. After visiting the site, and being very taken with this opportunity, my biggest fear with the new development is that the developers would not see the potential of this as an amenity, and only view it as an obstacle to their plans. Wide flat sites with no trees are everywhere, but sites with topography, trees and natural amenities, close to the city, are exceedingly rare in this region. 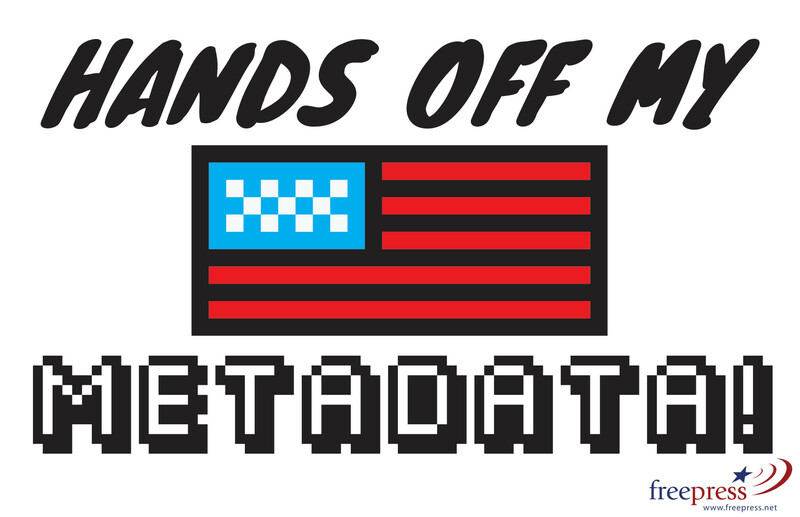 This is a chance we absolutely cannot squander. While access to the lake is going to be something that definitely needs consideration, the limited amount of available waterfront is going to be an issue. The good news is that there’s excellent grade away from the lake, which will allow for development close to the shoreline without the threat of flooding. In the end, though, I see this as a minor amenity to the site, more of an alternative gateway to the development, unless something can be done to maximize it’s use. That may come in negotiating access to the Dallas owned portion on the other side of the railroad which I believe could be achieved through a surface crossing of the tracks. In plan the railroad appears to be an immense barrier, but if creatively handled, in practicality, it may not be so much. While at first I was dubious about locating a civic building on the park land, I’ll have to admit that this is an excellent area for just such an opportunity. 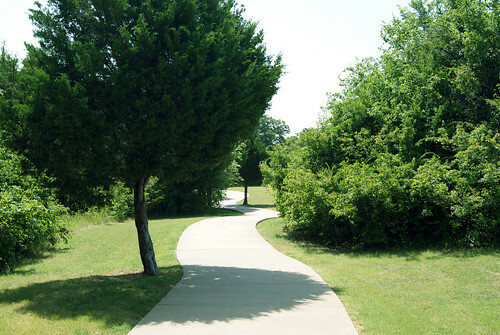 With adjacency to the walking trail within Pecan Grove, but well outside the best areas of the legacy trees, this site could certainly be developed without any detrimental impact upon what we all love about Pecan Grove, as well as provide a civic focus within the new development.